In addition to the people I work with, I have met a number of other interesting people as well. 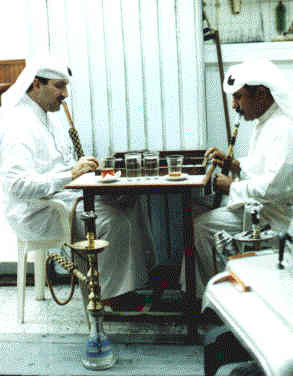 I have, for example, a great picture of two gentlemen sitting outside a café, playing backgammon, and smoking immense water pipes. I think they were smoking tobacco. I went to one beach where there were a hand-full of dark-skinned adults in a kind of cabana and three youngsters who immediately noticed that I wasn’t from this neighborhood. I talked to them, since they seemed to speak English a little bit. Eventually, I bid them "Ma’assalama" (Good bye). They were impressed. Sweet kids. Across the street from my hotel is the residence of the Kuwaiti Ambassador. The guard who stands by the gate is quite friendly, and always says hello when I pass. Occasionally I stop to chat a bit. From him I learned, for example, that the guns they carry are not Uzis or AK-47s, but something called an MB-2. He thinks it is from Germany. There. Don’t you feel better for knowing that? On another evening, he found out I was from Texas and wanted to know if I ride horses. He was disappointed when I said I didn’t because apparently he has been riding since he was a small child. He told me of some other places I should go see. He complained that with all the current troubles he now has to work two shifts. He was used to a much easier life. Last weekend started off on the right foot when I met a very nice French lady while I was ice skating. Anyway, I wanted a picture of myself, so I asked the French lady to take it, and one thing led to another (as it (fortunately) often does), and before you knew it, we had were in conversation. Her smart and lazy husband (her description, not mine) works at the French Embassy, and her nine-year-old daughter is some incredible skater. I hate having wee ones darting in and out and around me when I am trying just to get around the course. The girl came over to the railing to talk to her mother at one point and idly grabbed one foot to stretch it as she talked. Before I knew it, her foot was coming down on top of her head! Their previous posts have been in Germany, Moscow, and South Africa. She enjoys seeing different places, but she confesses to finding the life of a diplomat’s wife a bit trying. She basically has nothing to do. Her husband goes to work and her children go to school. But what does she do? Bahrain is very pleasant, but it is not Paris. She grew up as an Army brat, living in many places. When she married her husband she looked forward to settling down somewhere. But then he got involved in the diplomatic corps and here she is. By the way, that picture she took of me on ice skates will not appear on this web page! On one of the weekends, I went to the wildlife preserve. It is only about twenty years old, and is half refuge and half park. There is a small walking around area with camels and some birds, and a bus ride for seeing the rest of it. I arrived at 3:15 in the afternoon, and was told that the 3:30 bus was full. I would have to wait for the 4:30 bus. I wasn’t sure I wanted to do that, so I decided to wander around for a while. 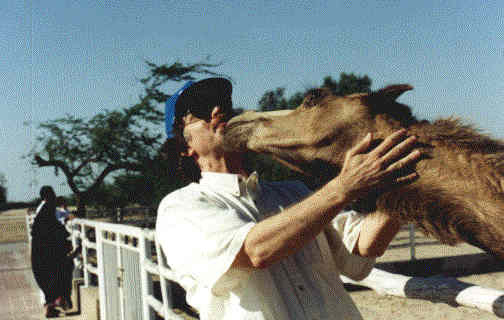 First I met two very friendly camels. I then came across a table with six fellows dressed in the usual Arabian robes, but instead of white, they were a kind of lavender. And instead of the usual headgear, they wore caps that were pillbox shaped and intricately embroidered. 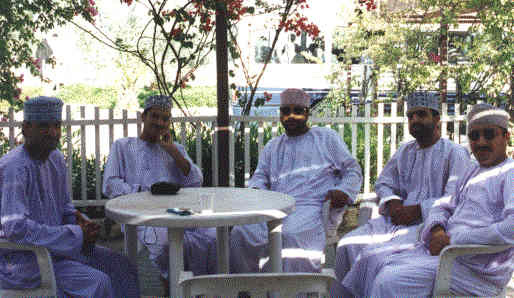 I asked them about their clothing and they said they were from Oman, which is another of those Saudi Arabian suburbs, down the coast of the Gulf. They also turned out to be very friendly and we sat and talked for a while. They are from Muscat, the capital, but the one who spoke English best is in Bahrain at college, learning to be a dental hygenist. At about 3:45, I decided I wanted to take the 4:30 bus after all, but was informed that that one was now full also. I told my new friends about this, wanting to make sure that they already had their tickets. They did, but one of the fellows has done this tour before, so he offered me his place! Ain’t that something?! So, after a slow start, I have begun to meet people. That is, after all, the whole point of traveling, and it is about time. The Arabs really are almost aggressively friendly, and it is nice, once you get used to it. The guard at the Kuwaiti residence told me that he likes Americans and British, because they will talk to him. Filipinos and other nationalities won’t give him the time of day.